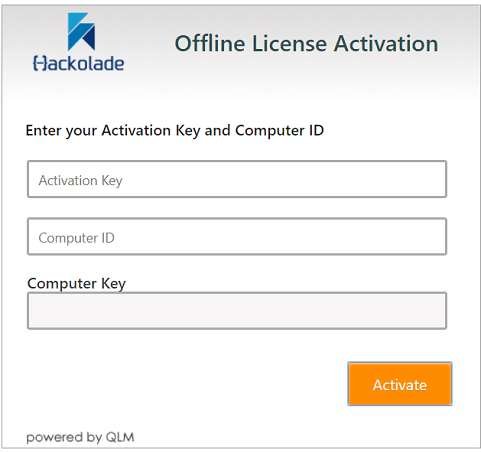 After downloading Hackolade, you need to obtain and register an activation key before you can use the application. You can initiate the process of getting an activation key either from the website, or from inside the application. Once you have an activation key, it needs to be registered from the application. Warning: If you have an HTTP proxy server on your network, you may have to manually set in the application the proxy parameters. You will find more information on the Network Proxy page. Go to the pricing page and choose the version you prefer (see here for more info). You will be directed to the Hackolade Store where you'll be guided through the checkout process. A license key will be generated and provided on screen and via email. You will need this key to access the application. Go to step 2 below for instructions. 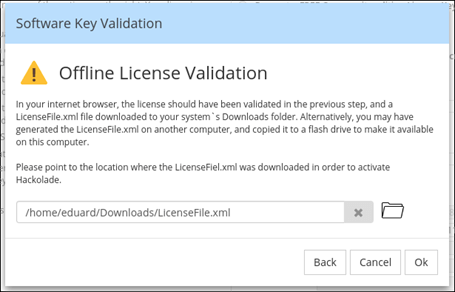 This screen can also be reached by going to Help > Software Key Validation. then click the Send button. You will be directed to the Hackolade Store where you'll be guided through the checkout process. A license key will be generated and provided on screen and via email. 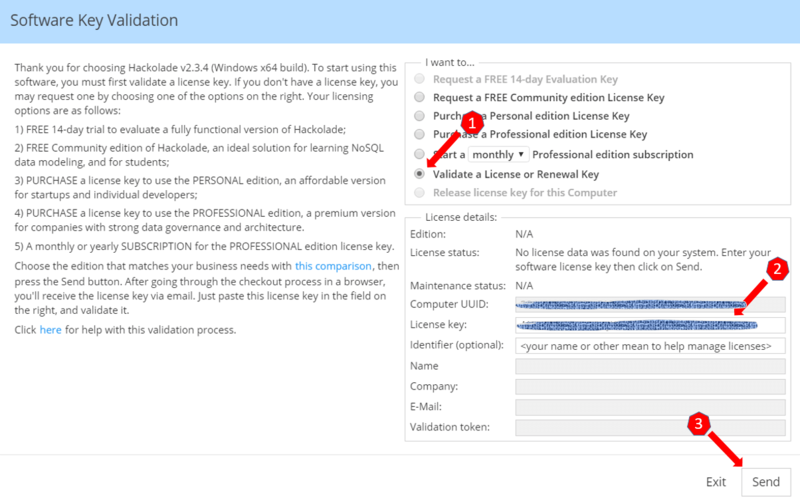 You will need this license key to access the application. Go to step 2 below for instructions. If you have not downloaded Hackolade yet, please do so from the download page. and Step 3: click the Send button. and the license details will be filled window will be filled. And the application should get activated. Do not modify anything in the downloaded file, or the activation will fail. 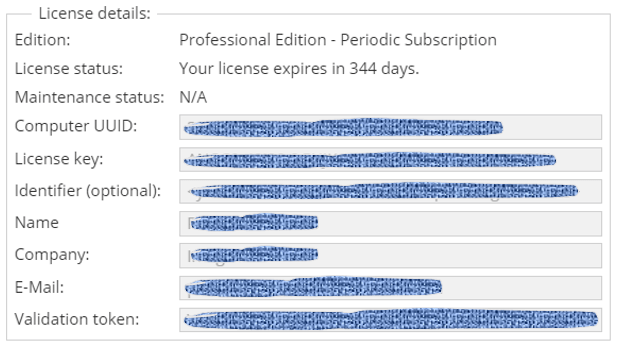 Our licensing is enforced through registration of the UUID on our license server. 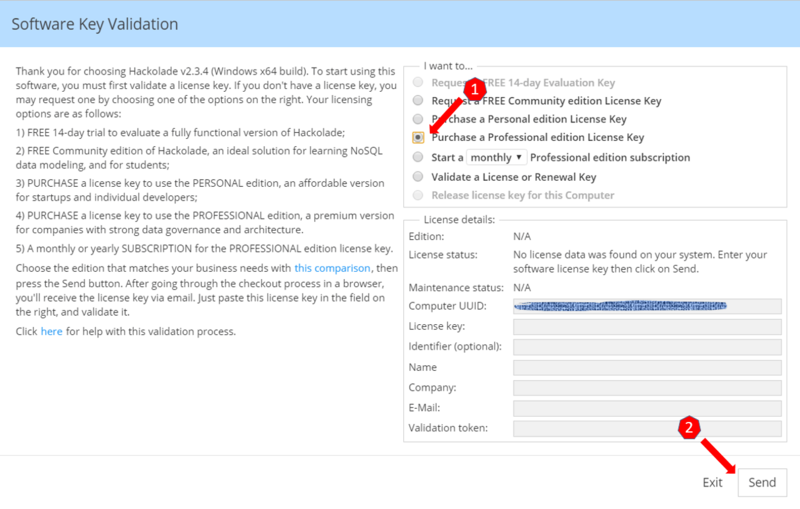 Each unknown UUID for a license key reserves a seat on our license server, until you reach the total number of seats purchased. As per this article: "Each virtual machine has a universal unique identifier (UUID). The UUID is generated when you initially power on the virtual machine... Suspending and resuming a virtual machine does not trigger the process that generates a UUID... If you do not move or copy the virtual machine to another location, the UUID remains constant." 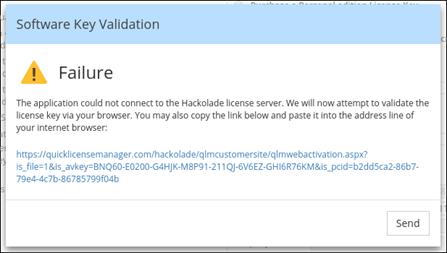 Important: the one thing to remember though is: before you delete a VM, make sure to release the Hackolade key via Help > Software Key Validation > Release. This is the only way for you to free up the seat of that UUID, and make it available for another one. Reminder: License metric is per "Operating System Instance" ("OSI") (i.e. PCs under Windows, Mac or Linux OS), meaning that each implementation of the software can be installed onto a physical system or a partition, such as a Virtual Machines system, virtual environments, virtual private servers, containers, guests and zones within the physical system. A physical system can contain multiple Operating System Instances.